What would be your ideal software/tools to help you write? Discussion in 'Software' started by OverTheHill, Sep 27, 2013. Hi! This seems like a great community. I've been an aspiring writer for a while now but never put in the dedication. I instead dedicated myself to programming and building websites/software. Writing is another passion of mine and I'd like to merge the two. I've come here for some general feedback and any ideas users might have about software or tools they currently use and what features they think would greatly help them further their writing potential. I know there is no shortcut for becoming a better writer (write. A lot. ), but I'd love to start an ideas session on how fellow writers could use technology to improve their craft. Do you find anything lacking with current tools (like evernote, for e.g. ), or more specific tools like Storybook. I have experience in all kinds of software (web, mobile, desktop), so what I'm saying is forget any technological difficulties exist. In a perfect world, how would technology help you maximise your writing? Tesoro, BillC, Cogito and 1 other person like this. Good Ol' fashioned Microsoft Word, it has the ability to put words in it (really important), keep track of the word count and when you're ready to edit its keeps track of the changes! MS word is good when I am writing from start to finish but I find a lot of times i jump around in the story when I'll get an idea and want to write it out before I forget it mostly I use a bit of software called newnovelist which is very good for writers like me who jump around the story a lot I will constantly get stuck at a spot not really knowing what is going to happen next so I will jump forward to write another spot then figure how to join them. I still like writing in word but I also use several pieces of software to assist me in moving the story along til I figure out what is going to happen next or how to connect the parts. I'm perfectly happy with a fountain pen and a stack of blank paper. My laptop has MS Word for when I need to put it all in the computer. Scrivener. I used to say Word was fine, and I guess it kinda is, but it's a beat-up old Ford Fairmont and Scrivener is a Ferrari. I do a lot of first draft stuff in pen and notebook, too. It's great writing like that. Nice and leisurely and very free-form. obsidian_cicatrix, Wreybies and FlyFast like this. I'm currently looking into Scrivener. I write in Pages, and like it a lot, but Scrivener apparently has the ability to morph your finished work into formats that are compatible with things like eBooks and Kindle. This might be something to consider—something that 10 years ago wasn't really a big issue. I'm perfectly capable of organising my writing, and have kept backcopies of previous chapter changes, keep a file of bits that have been deleted because of story flow but might be usable later, etc. I have research files, story idea files, rough outlines, etc. I don't really need a specialist programme for these things. However, as a novelist, I dearly wish for two template features that simply don't exist as far as I know. Timelines and Calendars. A Timeline is necessary to keep track of what happened when. This is necessary in a modern setting and/or historical setting, to keep everything clear as to how it relates to other events going on outwith the story. It's also necessary if you're writing Fantasy or Sci-Fi as well. Every world, even an author-generated world will have sequential events that need to be kept in order. A Timeline keeps track of character ages, when they interacted with other characters, when they moved house, etc. It might be important to remember that JFK was shot in November of 1963, if your character was in high school then. It was a hugely important event, and if you don't mention it in your story, your story loses authenticity. These kinds of connections—all these little bits of hard information—will certainly trip you up if you don't keep track of them as you write. I've started a Timeline file of my own, beginning with the year 1867—through to 1887. My fictional 'events' are listed in bold and the non-fictional events that underpin the story, or happen concurrently with fictional ones, are written in plain text. All of these entries can be subdivided into months, etc. This sort of structure is crying out for a commercially-produced 'template' isn't it? I wish Scrivener had one, but it doesn't. The other template I would dearly love to have is a Calendar. A blank calendar, so you can make it apply to any year you want. This will give you the day-to-day story planning that a Timeline won't. It will let you see what day of the week a certain thing happened, or will happen. How long it takes for certain things to happen, etc. This will be more useful as an immediate story planner, while the Timeline is more for organising background material. Again ...a commercial template would be excellent. I've had to make a physical calendar template, photocopy it, and keep it in a loose-leaf binder. It would be wonderful to have one on my computer instead. I use Scrivener and then LibreOffice for final formatting. I also use a fountain pen and paper at times. I used to just use MS Word, but now I am in love with Scrivener. I've been using it over 2 years, and there's still features that I find and get surprised about. I just wish that I had a Mac because it was originally made for Apple's OS, so they have all the super, super cool new features. The trickle down affect still applies for getting it to the Windows version. I tend to write in pieces, so it's nice having somewhere that it's all packed nice and neatly together. If I need to look at some details or my outline, it's literally just above the current piece I'm writing on. I used to be a pen and paper type of girl only, but that hurts my carpel tunnel quicker than typing does. Yay for technology! Thanks very much for the in-depth feedback and advice (esp. Jannert and TessaT)! I'll buy Scrivener and take a look. 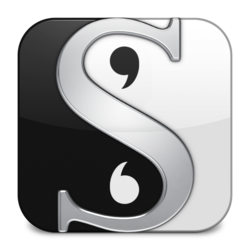 Before you buy Scrivener, which I love, try the free trial version. It gives you plenty of time to figure out if it will work for you and if it doesn't, you won't be out any money. for hand-writing, i LOVE sharpie pens (pens, mind you, not fine-tip permanent markers) and graph paper. Yes! graph paper! i dont always think linearly, so graph paper makes it easy to keep any little notes or tangents or impromptu sketches separate from the main body of text. I've been using Google Docs for writing recently because I can write from different locations (home and work) without worying about any file transfers and I like that it automatically keeps history - I can look at any previous version of the file without having to save them separately. I'm considering moving away from it for several reasons (one: I cannot rely on Google, of course I backup, but they've already changed their editor once and thrown away all editing history; two: the history doesn't let me easily compare any two previous versions, just from one to the next; three: the editor still lacks some features that I'd appreciate). I could use some version control system, but it would have to be something I can use online from different operation systems and it would have to allow easy browsing and comparing the versions, somewhat differently from what programmers would use. I haven't find a nice solution yet, so I'm sticking with Google until I come across something. Personally, I'm in love with Scrivener and Freeplane. I used to write everything in Word but the first time I used Scrivener, I realized how hard I had been making my life, haha. With Scriv I can keep everything all in one place instead of needing to have a dozen different documents each for maps, character info, world info, plot outlines, etc. With Scriv, I open one file and it's all there and I can just tab between what I need at the moment. It's much easier on my poor old laptop since one Scrivener document uses up much less space than a dozen Word files and also doesn't eat up a ton of RAM while I'm working. Freeplane has really been helping me with my outline and plot planning, too. Someone here recommended it a little while ago and it was another moment of "Wow, how have I gotten along all this time without this?" hehe. Snowflake Pro is also useful for building on bits of information but my boyfriend uses it more than I do. I prefer Freeplane. I'd want a programme that functioned like a blank piece of paper and a pen, but I wouldn't need to hand-write, I could type...I don't even know if that sounds logically possible but I want it. I agree completely with the first answers, I have me, ms word and that is pretty much all I need. Don't have to rely on "writing tools" or software to maximize my writing. I can do that on my own. I have Atlantis (basic). A typewriter would work as well, or pen and paper. I sometimes think people (in general) get too involved with all the bells and whistles, none of which will make your actual writing any better. There has been an industry-wide propaganda machine feeding the masses the idea that MS Word is THE application, and I hear people talk about MS Word in terms of "plain old, simple..." That application is anything but. It is overworked, over-tweaked, and overgrown. It is the epitome of "bells & whistles", not the antithesis. It eats a criminal amount of hard drive space, costs a fortune, and on a Mac it's a lumbering, slow, hassle. Applications on a Mac very, very seldom cause the rainbow swirl pointer telling you it needs a second. Word makes it pop up with almost every other click of the mouse. Inelegant. I use Google Docs and Google Drive to work and store everything. Google Docs does everything MS Word does in much sleeker fashion, and Google Drive has so far allowed me to organize everything very easily. I've only just started using it for this project, and I have backed up copies on my hard drive and will be getting a USB backup (yeah, yeah, I still don't have one ) when I actually have money. There is a lot of good software out there, and a lot of good openings for new stuff, but I'm old-fashioned at heart despite being young. Trusting in the Cloud is about the most technologically advanced thing I've done with my writing, and I'm not really hurting too much for anything else at the moment. I have tried so many different writer programs: yWriter, Scrivener, FourPage and probably at least 5 more I forget the names of. I always come back to Word. It's just a page and typing. No folders, forms, pop-up screens of random stuff. I remember plugging one of my novels into Scrivener once: all the character slots and setting stuff etc. Halfway through I kinda woke up and told myself, "You could be writing right now." Of course I know you don't have to use all that stuff, and I do see how it could be helpful to someone, but not for me. I've written some short stories in Notepad before. And I feel the same about Wishy Washy Windows. Right from the box knowing it will crash on occasion? No, thank you. Plus, the criminal amount of disk space and the cost is a universal, as are the "bells and whistles" one is paying for and never using as a novelist. Just check the toolbar at the top of that thing. It's like Mayan hieroglyphics. Scrivener doesn't pretend at being a desktop publisher or a graphics application. It has only one goal and tools only for that goal: the creation of a manuscript. Nothing you buy to record the words is going to do more then act as a typewriter and notepad for you. It won't teach you your craft. It won't tell you that you've just written an unneeded tag, or that you didn't address the three questions a reader needs answered quickly on entering a scene. All it will do is record whatever you type. You probably have the story idea. And that's good. You have the desire, and we hope, the perseverance. Assuming you've taken the steps necessary to acquire a few of the tricks-of-the-trade of writing fiction for the printed word—over and above the nonfiction techniques we learned in our school daze—now you create your scenes, arrange them in a way that smoothly raises tension and suspense, and place them on the page. You can type or dictate, but the job, from start to "the end" is yours alone. When I face the desolate impossibility of writing 500 pages, a sick sense of failure falls on me, and I know I can never do it. Then gradually, I write one page and then another. One day’s works is all I can permit myself to contemplate.